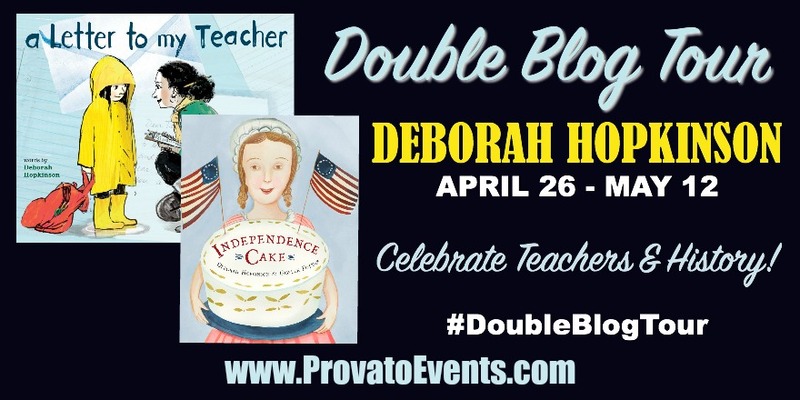 Master of the historical fiction picture book Deborah Hopkinson takes us back to late eighteenth-century America and the discombobulated home of Mrs. Bean, mother of six strapping sons, who simply can't manage—until Amelia Simmons arrives and puts things in order. And how well she cooks—everything from flapjacks to bread pudding to pickled cucumbers! She even invents new recipes using American ingredients like winter squash. 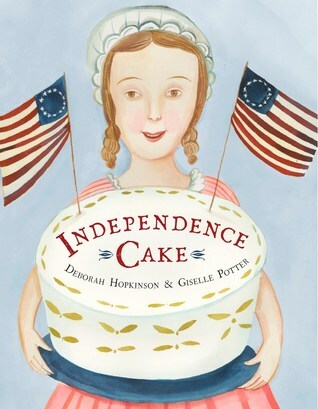 Best of all, she can bake, and to honor the brand-new president, George Washington, she presents him with thirteen Independence Cakes—one for each colony. "Delicious!" he proclaims. Author's Note and original recipe included! Hopkinson has done a great job with this fictionalized look at the life of Amelia Simmons who published the very first American cookbook. She portrays Amelia as a go-getter who doesn't let the loss of her parents and her need to work as a servant stop her from developing her abilities. As Amelia works as a servant for Mrs. Bean and her family of six boys she starts experimenting with different ingredients and dishes (no lack of meals to prepare with six boys in the house). 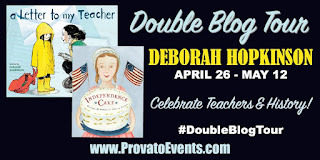 Eventually she develops the Independence Cake when some prominent ladies in the community come to her wanting her to bake a cake for the new president, George Washington. The illustrations and text convey a nice introduction to life in the Revolutionary Era. I enjoyed the theme surrounding Amelia as she makes the most of her circumstances. Dear Teacher, Whenever I had something to tell you, I tugged on your shirt and whispered in your ear. This time I'm writing a letter. So begins this picture book about a girl who prefers running and jumping to listening and learning and the teacher who gently inspires her. From stomping through creeks on a field trip to pretending to choke when called upon to read aloud, this book's young heroine would be a challenge to any teacher. But this teacher isn't just any teacher. By listening carefully and knowing just the right thing to say, she quickly learns that the girl's unruly behavior is due to her struggles with reading. And at the very end, we learn what this former student is now: a teacher herself. The power and influence of a good teacher can never be overstated. And the little girl who is writing a letter to her former second grade teacher as an adult shows that so beautifully. I loved how the teacher welcomes the girl to school. Since this girl prefers to stomp in puddles and explore the world and struggles with school work, she goes to school very reluctantly. 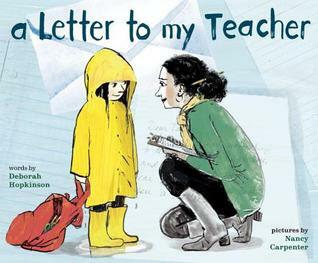 The letter takes the reader through the whole school year through the ups and downs, successes and failures. While neither the teacher nor the student is perfect (and it shows in the story), they do develop a close relationship that ends up paying off in a surprising way. Carpenter's tender illustrations perfectly illustrate the little girl and her teacher and their learning adventures. A book that every teacher should own and every school display.